Edwin A. Link has been described as a "backyard inventor" and is credited as being the inventor of flight simulation. 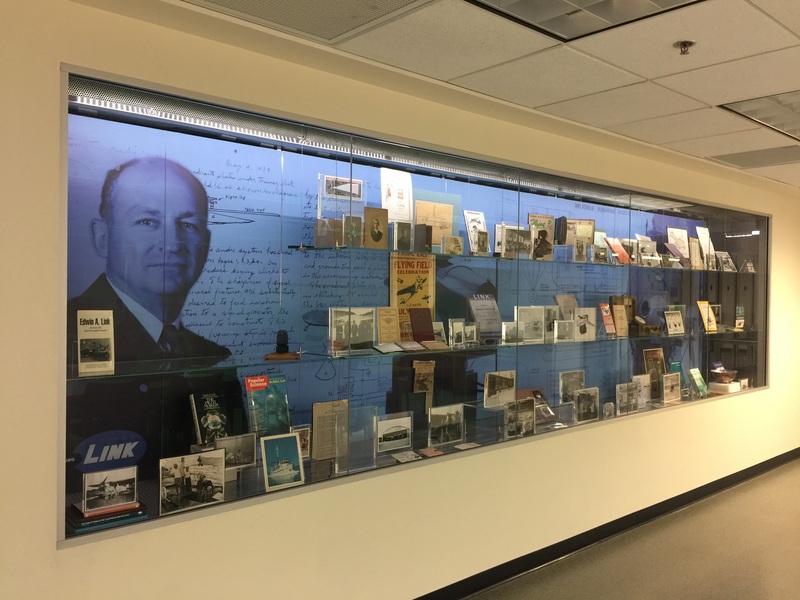 Known for his Blue Box trainer, Link went on to invent a number of aeronautic devices and trainers designed to train pilots and improve safety conditions. After building a successful company, Link retired and turned his attention to underwater explorations and inventions. The Link Collections consist of more than 10 separate collections, including The Edwin A. Link, Jr., the Marion C. Link, The Marilyn C. Link, and the George T. Link Collections. The Link Collections Exhibition in the Bartle Library consists of a touch screen video display and a 20-foot exhibit case. The touch screen video display has historic Link films, photographs and digitized player piano music that is available for viewing and listening. The exhibit wall display case has over 100 original items from The Link Collections, including a Link Bubble Sextant. The Link Collections Exhibit Wall has been made possible by the generous funding from Marilyn C. Link, the Link Foundation, and Tom and Nancy Kelly. To learn more, visit The Link Collections.